Check out this gently-used 2007 Acura TL we recently got in. This 2007 Acura TL comes with a CARFAX Buyback Guarantee, which means you can buy with certainty. CARFAX shows that this is a one-owner vehicle -- no wonder it's in such great condition. Low, low mileage coupled with an exacting maintenance program make this vehicle a rare find. 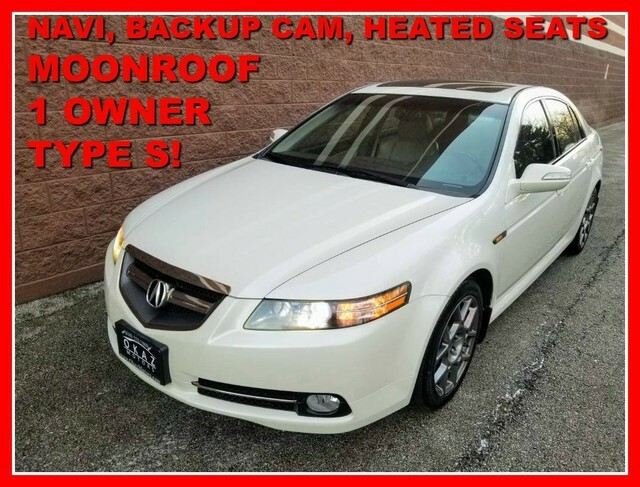 Marked by excellent quality and features with unmistakable refined leather interior that added value and class to the Acura TL You can forget your phone at home, but thanks to this car you'll always have your navigation system. How often was the oil changed? Were important service intervals taken care of? You'll have the records on this vehicles to know for sure. Clean interior? How about flawless. This Acura TL looks like has never been used. High performance is what this vehicle is all about. You will be reminded of that every time you drive it. When this vehicle was shipped from the factory, Acura decided that no option should be left off of this magnificent automobile. So, if you're in the market for a Acura TL Type-S that is equipped with copious amounts of options, then we may just have the perfect vehicle to suit your needs. The Acura TL Type-S is exactly what you would expect out of a Acura. It's decadently opulent, meticulously engineered and unapologetically grandiose. More information about the 2007 Acura TL: The 2007 Acura TL skillfully combines power, luxury, safety, and reliability in a practical package, all while remaining at the lower end of pricing in its segment. To further its appeal, the Type-S returns after a four-year absence to satisfy performance enthusiasts. This model sets itself apart with Luxury, performance, and reliability, all in one, loaded with features, and tremendous value.